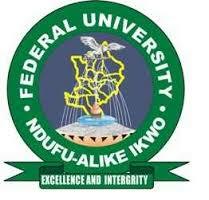 Alex Ekwueme Federal Univesity, Ndufu-Alike Ikwo (AE-FUNAI), Abakaliki, Ebonyi State, French Language Proficiency and Professional Programmes Admission Form and Guidelines for 2019/2020 Academic Session. INTERESTED APPLICANTS ARE TO CHECK ON THE WEBSITE OF AEFUNAI: www.funai.edu.ng. OR CONTACT THE PROGRAMME COORDINATOR FOR MORE DETAILS.